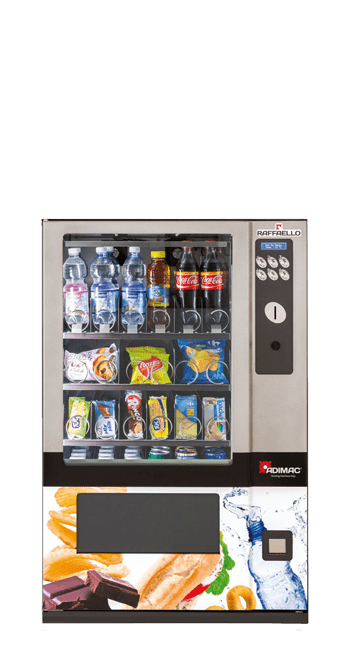 Very compact refrigerated automatic vending machine for snacks and drinks, Raffaello is the most functional solution of Adimac range. Raffaello, appropriate automatic vending machine for small positions, in a few space can contain 4 trays and 24 different products. Despite the small size, Raffaello is equipped with and internal adjustable refrigeration that can arrive at +3°C on all trays, in order to sell from the classical snack, to the drink, up to products that need lower temperatures as yogurt and sandwiches. Raffaello is equipped with a run-in technology, but to low cost, appropriate for positions without particular demands. The machine electronic allows to connect a limited number of payment system like changegiver, coin acceptor or cashless system.